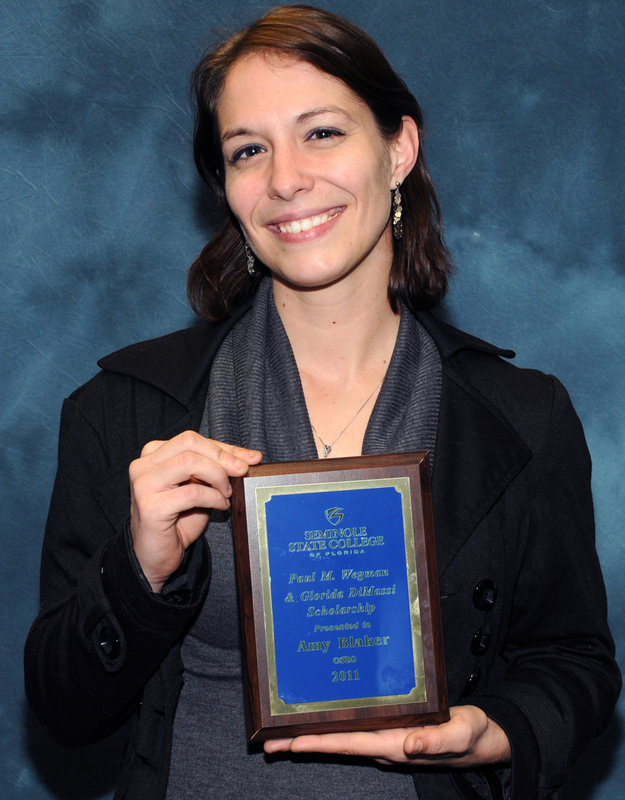 Amy Blaker has been awarded Seminole State’s first Paul M. Wegman Endowed Scholarship for theater students . Blaker, 25, who stage-managed the Fine Arts Theatre’s production of Seven Guitars, learned about her award at the Feb. 5 performance of the show. In announcing the scholarship, Paul Luby, associate dean of Arts and Communication, said that Blaker was “a big, big part of the success” of Seven Guitars. The Longwood sophomore plans to complete her Associate in Arts degree this summer and pursue a bachelor’s degree in performing arts. She’s hoping to do her graduate work in California, where she’ll be close to the action for a career in acting or stage management. Luby explained that the scholarship’s namesake was a renowned performer in Central Florida who got his start at Seminole State, studying with the late Sara Daspin. Daspin, who passed away in 2008, was instrumental in setting up the scholarship. Wegman, who died in 2004, performed leading male roles at virtually every theater in Central Florida, from the Orlando Shakespeare Theater to the IceHouse Theatre in Mount Dora. He was also a renowned female impersonator, whose signature character was the profane Miss P.
Blaker’s $500 award also included funds from the Gloria DiMasi Endowed Scholarship for fine arts students. The Foundation for Seminole State College awarded more than 1,100 student scholarships during the 2009-10 academic year. For information on creating a scholarship at Seminole State, please visit www.seminolestate.edu/foundation, or call 407.708.2429. This entry was posted in Awards, College and university theater, In memoriam, Orlando theater and tagged Amy Blaker, paul wegman, Sara Daspin, Scholarship, Seminole Community College, seminole state college, Seminole State College of Florida, Seven Guitars. Bookmark the permalink. WOOOOOOHOOO AMY! Amy is our ongoing asm/sm at Empty Spaces! Bravo dear Amy!